It’s BTS season. For most of us with school aged children that means some sort of meet-the-teacher parent night with lots of handouts. 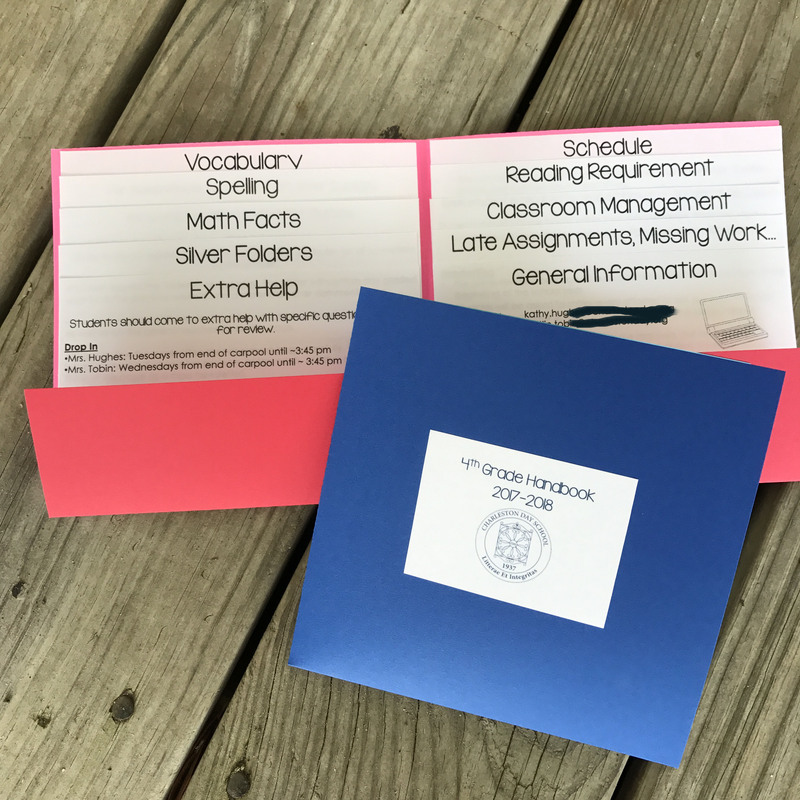 Since I am a teacher too, I know the BTS parent night handouts have valuable information in them– when to wear PE clothes, lunch procedures, HW procedures, acceptable pencils… We all receive these pamphlets with key classroom information that get dumped into that junk drawer in the kitchen. 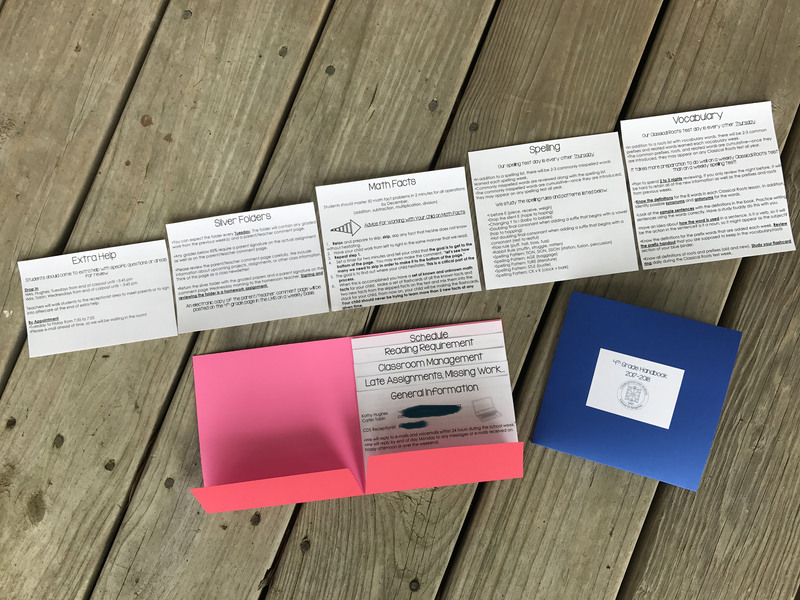 For the past few years, I created a flip book and attached a magnet to the back, so parents could hang the booklet on their refrigerator in plain sight. I still like that idea, but I was getting tired of making them, and my pages never lined up correctly (which bugged my OCD nature to no end). This year I folded mini pocket folders with card stock and inserted individual cascading pages by modifying my old flip book file. You can see the headings of each page of information and pull out that insert to get the information you need. I think these folders will still get dumped into the kitchen junk drawer, but I like the construction of them, the final size, and the way you can view the information headings. Use 8 1/2″ x 11″ card stock. Cut cardstock to 7 1/2″ x 11″ size. I found Astrobrights cardstock paper that was double colored, so each side has a coordinating color. It makes the final pocket folder more interesting. I have a paper scorer to make guidelines where I need to fold. You could use a ruler to measure and fold by hand. Set the paper in landscape direction. You will fold along the long edge of the paper at 5 1/2″ (bottom of the paper folds up 2″). 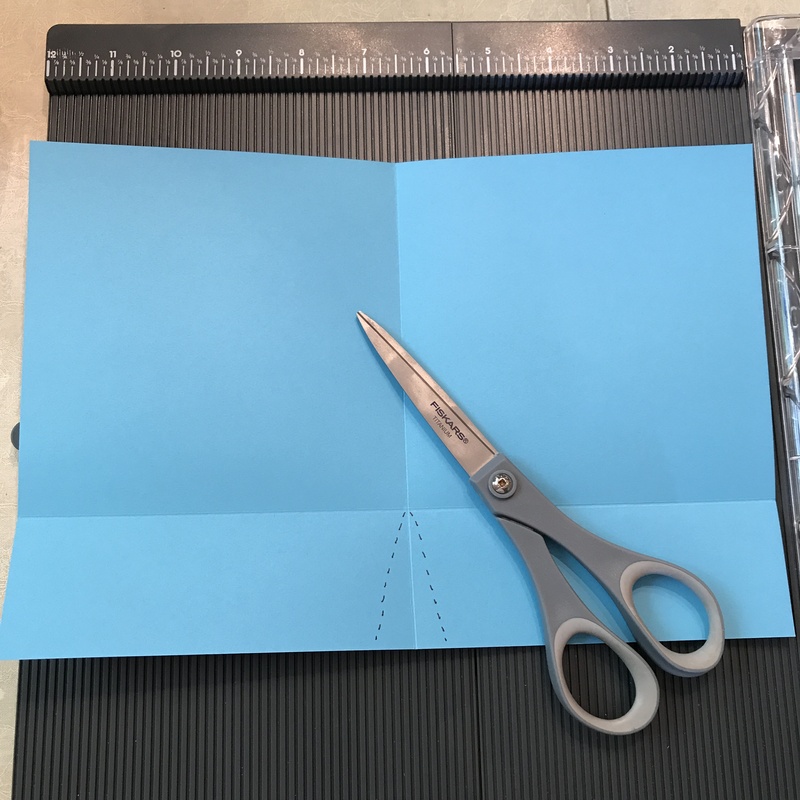 You will fold the paper in half at 5 1/2″ down the center. After pre-folding, open the paper flat and cut a skinny triangle along the 2-inch flap. The tip of the triangle will be 2-inches into the paper at the 5 1/2″ fold. This will allow the bottom flap to fold up neatly without bending or buckling in the center. I created THIS TEMPLATE in MSPowerPoint. There are 10 slides (plus one slide with teacher notes) with editable textboxes in different sizes. 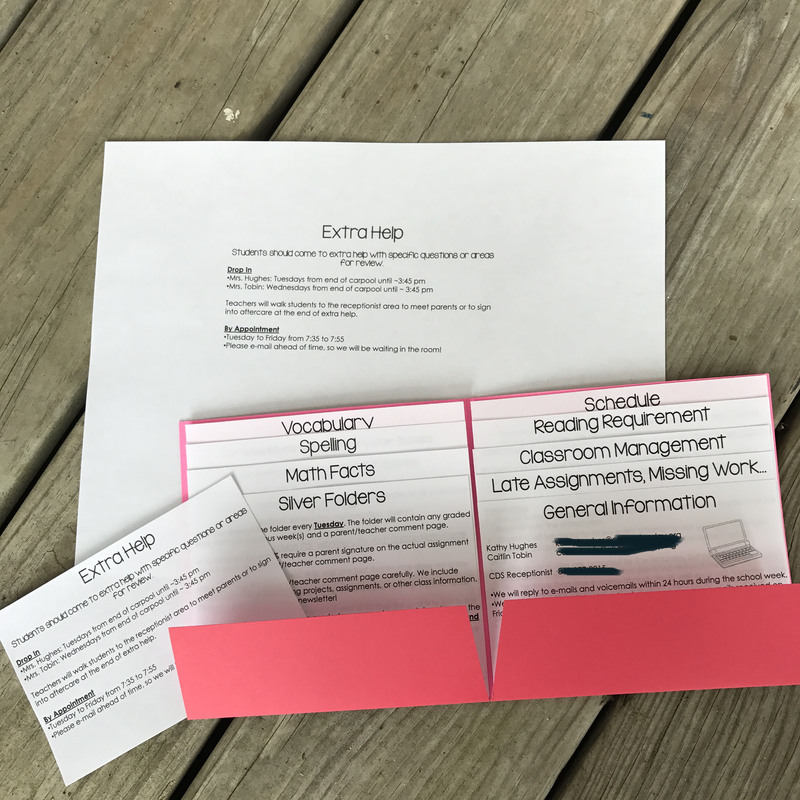 Fill the textboxes with the essential information for your classroom. Each slide page is 5 1/2″ x 5 1/2″. I printed on 8 1/2″ x 11″ paper, so lots of cutting is involved. Print the pages and cut to the correct sizes with a paper cutter. All pages will be 5 3/8″ wide. The heights vary by 1/2″. The tallest page is 5 1/2″. The shortest pages is 3 1/2″. You could add one more pair of pages for a total of 12 pages (6 on each side), and the shortest page would be 3″. I cut the width of the pages first. Then, I cut near the header next. 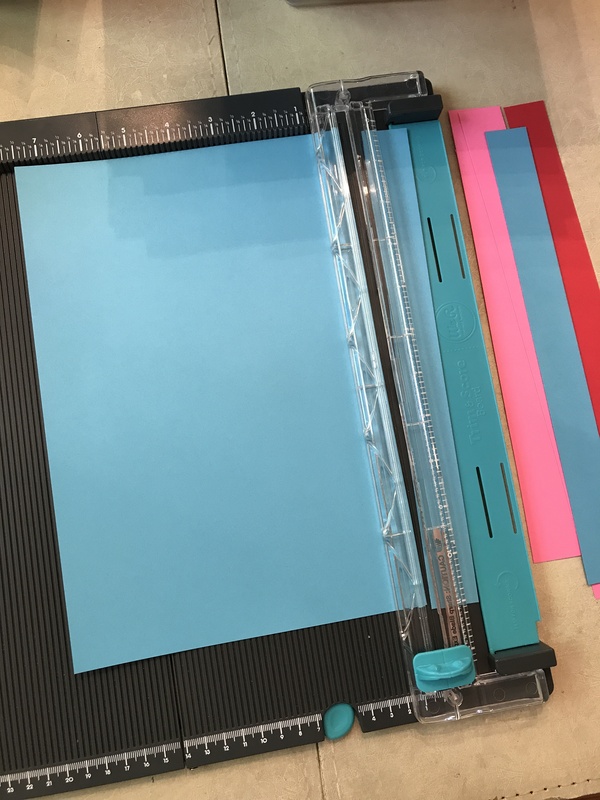 For me, if I lined up the paper at 7″ on the paper cutter, it would cut at the perfect place above the header for all pages. 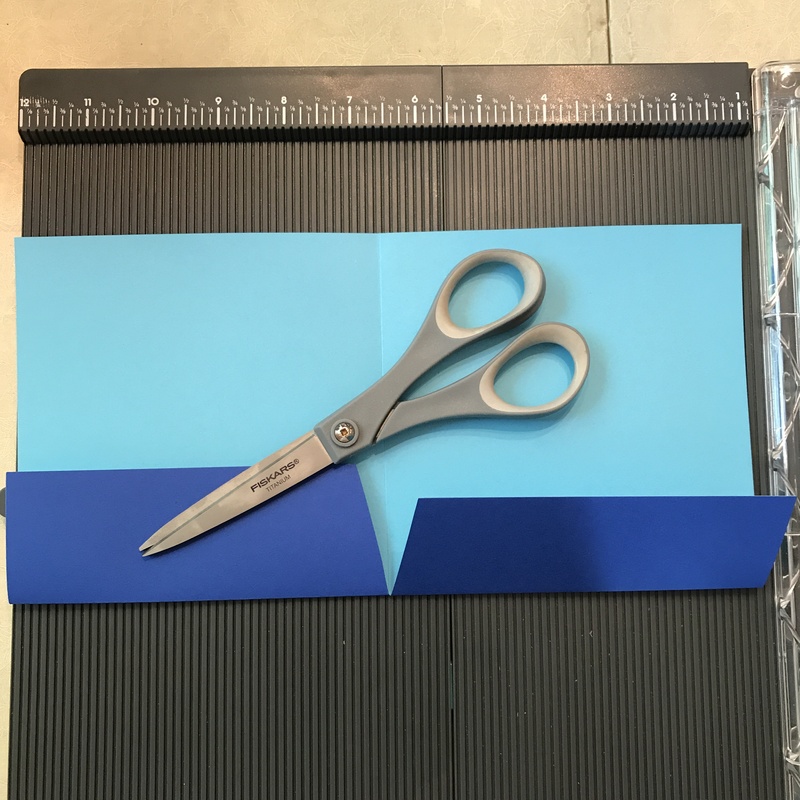 After that cut, I would flip the page and cut my varying heights beginning with my largest page (5 1/2″is the tallest; 5″ is the next height; 4 1/2″ is the next… down to 3 1/2″). Cutting the pages down to size is time consuming, but I think the final result is well worth it! As a final step, print or write a title on the front of each folder. 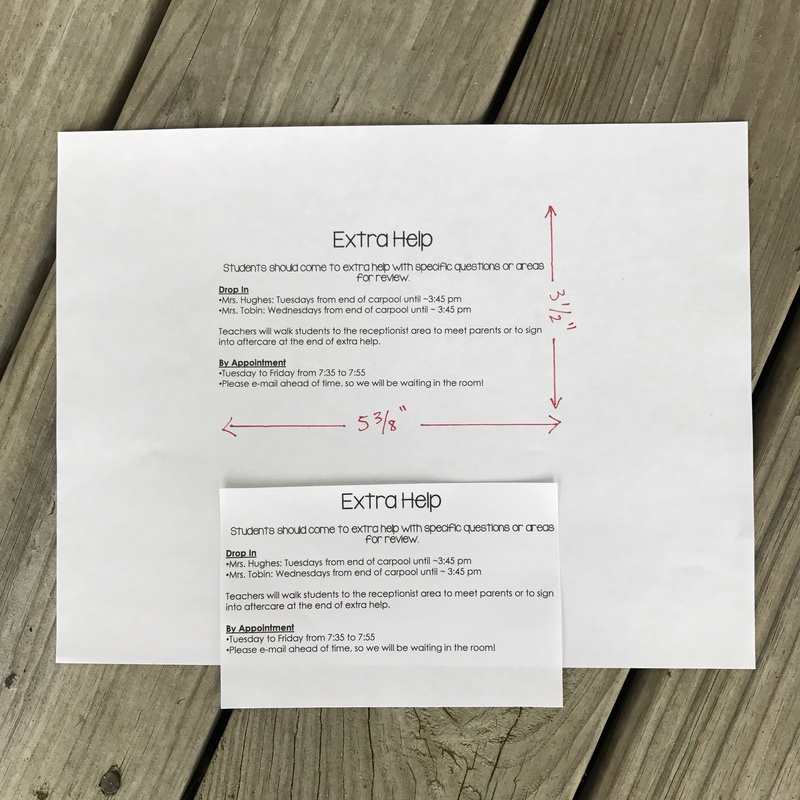 I printed a label on 2″ x 4″ Avery shipping labels and then cut the labels to 2″ x 2″ because I liked the square shape on the folder covers (and I happened to have that label size in my massive paper supply).